Mixed use project consisting of: 87,362 sq. ft. of retail and retail support use, including 30,000 sq. ft. of restaurant use; 38 market-rate condominiums; 13 inclusionary housing units; 8,408 sq. ft. of coastal/community use; 377 parking spaces; construction of an onsite desalination plant; rehabilitation of the San Xavier Fish Reduction Plant as a history center with an adjacent history plaza; replication of a utility bridge; and development of a community park. The project applicant is Cannery Row Marketplace LLC. The project would construct retail stores, restaurant space, condominiums, parking areas, and an onsite desalination plant. 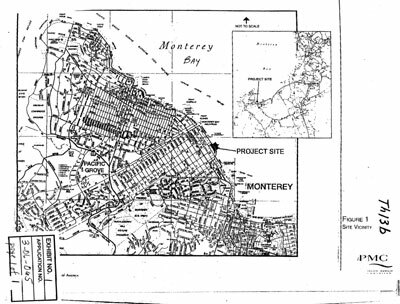 This project is governed by the City of Monterey’s General Plan and the Coastal Act. 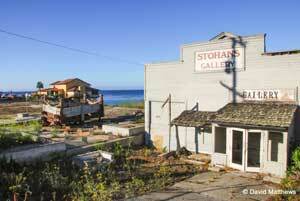 This project was approved by the City of Monterey in June 2004. The Environmental Impact Report was completed in 2001. Approval of the project would set a state-wide precedent that would allow a private desalination plant along our coast. The cumulative impact of this project along with the other small desalination plants already approved in the Marine Sanctuary could also jeopardize a long-term solution to meeting water supply needs on the Monterey Peninsula. Public drinking water for the project area is managed by the Monterey Peninsula Water Management District (MPWMD) and is provided by the California-American Water Company (CalAm), which is the retail water purveyor for the Cannery Row area. The City of Monterey, however, is currently using its full allotment of water from the MPWMD and additional domestic water from CalAm is not available to serve the project’s water needs due to restrictions on pumping from the Carmel River and Seaside aquifer which are the sources of Cal-Am water. Therefore, an onsite desalination plant is proposed to provide water for the project. As currently designed, the proposed onsite desalination facility is not consistent with the Coastal Act due to impermissible fill and dredging of ocean waters, as well as potential entrainment impacts due to a backup open ocean intake line. Commission staff has previously requested that a more comprehensive entrainment study be completed for the project, which has not been done.